I don't think this one will move again, unless perhaps "olancha" is published as a "legal" subspecies, in which case it will not be listed as "no taxon" on BugGuide, but rather a subspecies. This one has sort of unintentionally turned into a "guinea pig". I spent a lot of time looking at "Xanthippus" olancha in the field this spring, and your specimen fits that "subspecies" best, though it is from within the broad area where "olancha" and "typical" lateritius blend. So, it turns out that I was wrong; X. olancha blends into "Cratypedes" lateritius northward and eastward, and is part of that species. These "olancha" from California and Nevada look a lot like insects that appear to belong to X. corallipes on the Snake River plains and in the Wyoming Basin, but it turns out - at least based on all the evidence so far, that they are different. There is still more to learn and more sorting out of what is related to what left to be done. Some of the names for members of this group have been misapplied and need fixing. and keep coming back to them and then going away uncertain. I've looked at a lot more of these insects during the last two years, and have refreshed my memory quite a bit as to just what each species looks like where. Your's here is a large specimen, and the structure is that of X. corallipes. When I look at the venation of the wings, the structure of the pronotum, and the sculpturing of the head, they all come up corallipes. This speckled coloration is confusingly similar in both species in some regions, and the books don't allow for it in X. corallipes; however, in my experience it is common in populations found from w. Nevada to s. Idaho, w. Wyoming and into parts of n. Utah and nw. Colorado. Very confusing creatures. Anyway, I'm pretty sure I was wrong before, and I'm going ahead and moving these photos to X. corallipes. I should add that I've found the two species together in the same places in Utah, Arizona, and Nevada, and they are clearly different things). I should also mention that X. olancha in the Sierra Nevada and westward is also very similar (perhaps is a ssp. of X. corallipes), and these western Nevada insects may be closely related to those from California (but the Nevada specimens usually have the inside of the hind femur less strongly marked with dark color). Sorry about the uncertainty and any confusion. 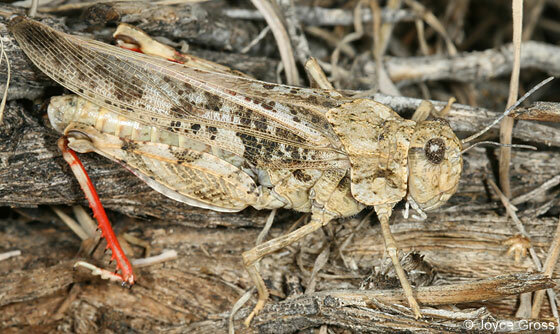 Moved from Nevada Red-winged Grasshopper. Moved from Grasshoppers, Katydids and Crickets. Xanthippus corallipes and Cratypedes lateritius can be confusingly similar in the Great Basin. It helps to see the fully spread wings, where the dark band looks somewhat different. I might have it wrong, but I think this specimen is C. lateritius. They are easier to tell apart in life than from photos. I think many populations of X. corallipes are being confused with C. lateritius because of similar coloration, and at times I have doubts that the two are even different species. This is either Cratypedes or Xanthippus. I always get those two confused, in part because grasshoppers are no longer a primary interest of mine. Excellent images as always, and should be 'easy' to get a species ID at some point.